• Brain peaks and Brain rhythms : two MIDI play modes with left & right brainwaves and their coherence. 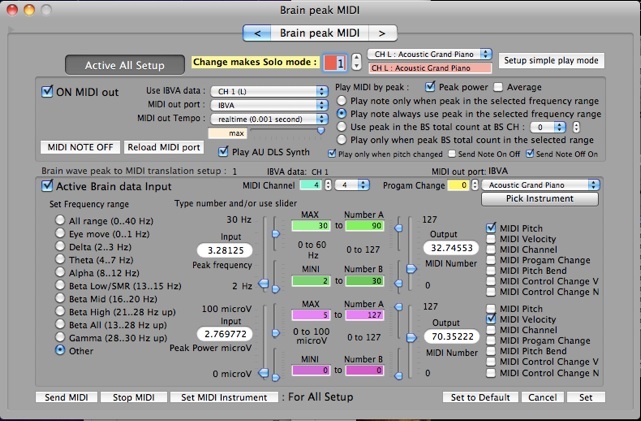 A simple setup to play MIDI from left & right brain wave peaks. • 3D water fall graph with different color, texture mapping and custom dynamic texture effect. • 2D bar graph for detailed frequency analysis, maximum 8192 point FFT calculation for 0.015 Hz frequency resolution when 120 Hz sampling. 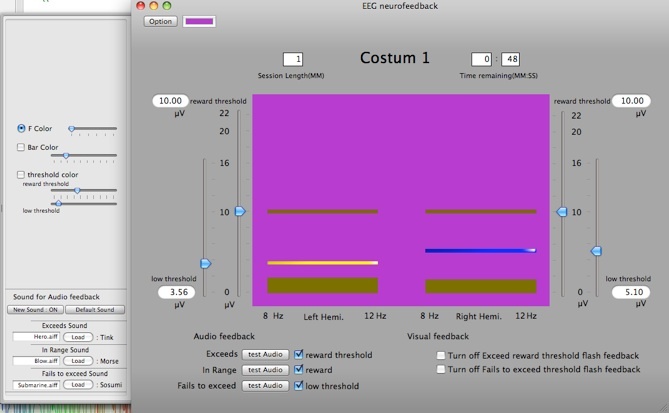 • EEG Neurofeedback (right) a training module in the traditional style, you set your custom frequency and amplitude thresholds and receive audio feedback along with the ‘high-jump’ animation for 1 or 2 channels. At the end a percentage is provided on a new screen after the set amount of time has elapsed (can run in the background of IBVA software controls) for success scoring, can export data to API for statistical historical conversion. Brain peak and brain switch ‘VJ’ notifications for interactive animation and sound. 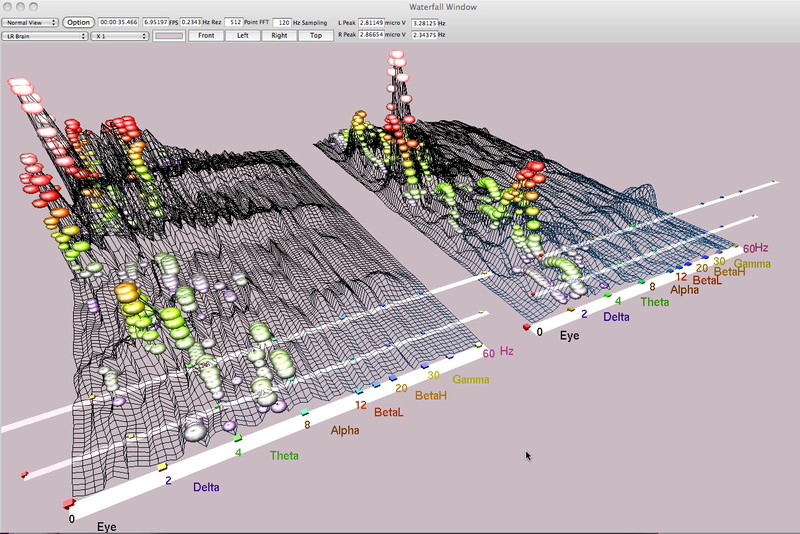 3D Waterfall graph now has Stereoscopic display window ! You can connect to a 3D TV via HDMI to see experience this latest stereoscopic display. 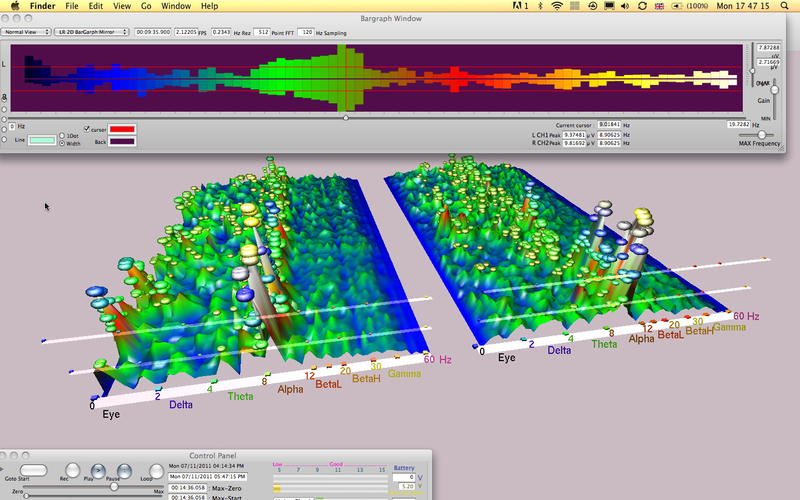 (left) The Raw wave window – 2 channels Spectral analysis from 0-60Hertz, and underneath the classic “Mindmirror’ 2 channel reflected display for training such as Maxwell Cade and Anna Wise’s models (right) The 3D waterfall animation of 2 channels with Mindmirror horizontal bar above. iPhone server window use for communicate with an iPhone as brain switch controller (development ongoing). Sends Brain rhythm and Sound power to iPhone. Our hardware also connects on a pc using BrainBay: an open source application supplied with every brainmachine to run on Windows, Linux and Vista 7. 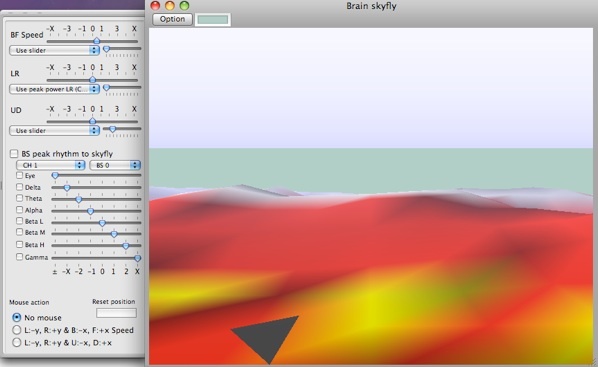 Brainbay is a versatile, free biofeedback software, developed within the confines of OpenEEG project. It enables graphic configuration of physiological data processing and presentation of feedback signals with graphs, animations, MIDI synthesizer, video and audio files.